https://scottishantiques.com/victorian/drinking-glasses?product_id=.... The glass is approximately 7inches high by 2 inches. The problem I had with this is that I don’t have the glass, I am an avid collector and this is becoming more of a hobby and hopefully a business as I am unable to work at the moment due to my brush with cancer. My mother has the glass (she picks things up for me at goodwill she thinks I will be interested in) but she is in America and I am in England. I have given her instruction with regards to the photo etc. You will have to excuse my lack of information initially.Absinthe is one I had not considered, I don’t think it is made with hallucinogenic properties these days. Made Van Gogh chop he’s ear of didn’t it? 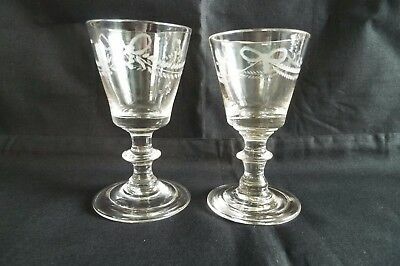 The closest in etched pattern I've found to yours can be found on several Georgian 18th Century Engraved Folded Foot Gin/Port Glasses c1730. "Bow and swags" or "Swags and Garlands" engraving. I'm not sure if yours could be of this era or simply be a copy of the design. This is not some other example, it is the OP glass in the second photo. So it is another view of the same glass that is being asked about in this thread. The best way to access old glassware is to look at the foot, so you would need additional pics. My sense is that the sides are too straight and thick, so it is not hand-blown. The decoration also does not look very early to me. My guess would be about mid 20th century, though closeup pics of the foot and sides could push that back as far as late 19th century Victorian/Edwardian.